On December 10, the Albany Planning and Zoning Commission convened a Study Session to consider new Community Services and Facilities policies. 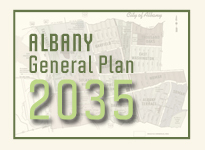 The policies are to be included in a new Community Services and Facilities Element of the Albany General Plan. They cover important topics such as schools, libraries, police and fire services, civic facilities, public art, child care, and infrastructure. This will be the first time Albany has had a specific chapter of its General Plan dedicated to this topic.